Wash the sweet potatoes well, removing any blackened bits. Cut them in half and add them to a pan of boiling water. Simmer on a medium heat for 10-15 minutes or until they are just getting tender. Drain the water away and add the sweet potatoes to a baking tray. Drizzle on the oil and toss until coated. Bake in the oven for 10-15 minutes or until the sweet pototo skins start to get crispy on the outside. Meanwhile make the pesto by placing all the ingredients in a food processor and blitzing until combined. You may want to add the olive oil in stages as some people prefer more or less oil in their pesto. 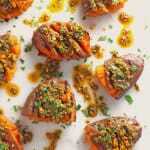 This recipe makes more pesto than you will need for the sweet potatoes. However it can be stored in the fridge for 4 or 5 days or frozen into portion in individual freezer bags or ice cube trays.